Included more lyrics from Jubilation. Thanks to Mark Atkins for the transcriptions. New photos from one of the "Keyboard Masters" concerts with Garth and Maud Hudson in Ontario earlier this month. Levon Helm & the Barn Burners played with Hubert Sumlin in Chester, NY, last night. Here are a couple of photos from the gig. Added an MPEG-3 file (3.4MB) with a 1964 live recording of Levon and the Hawks performing a wonderful version of Sam Cooke's "Bring it on Home to Me." Thanks to Lukas W. for the contribution. The Right Stuff: Philip Kaufman's rousing movie finally found its audience in the video age: The Right Stuff is generally regarded as the best, most exciting film made about the U.S. space program. Warner's two-disc set packs the three-hour-and-13-minute film onto a single disc, uninterrupted (unlike the previous DVD). The Oscar-winning sound returns in hair-raising Dolby Digital 5.1. Levon Helm, who narrated the film, returns to talk over a trio of new DVD documentaries, his voice having migrated well into Chill Wills territory. Two of the docus look back at The Right Stuff; the other checks in with the surviving astronauts. Most of the film's key participants roll out for interviews and reminiscences. Thanks to Joe Lore for sending us these photos, shot yesterday at Levon's barn/studio in Woodstock, NY. Ho-ho-ho! Santa is back again... now what? Interesting stuff at the Covers Project web site: "Crying Heart Blues"? Elvis Costello? Suntanama? Dobie Gray? Scott McClatchy? Blues Traveler? The String Cheese Incident? Charly Garcia?! The great Motorpsycho?!! Bruce Springsteen?!!! Hmmmm..... We need to do some serious updates in the "cover versions" section of this site. Where is this sample (320K) taken from? Happy Holidays to everybody from us at The Band web site. Added a photo of former Hawks and Band pianoman Stan Szelest on stage with his band the Ravens in 1961. Thanks to Pete Haskell (the Ravens' bass player) for sending us the photo. Included lyrics for some of the songs on Jubilation. Thanks to Mark Atkins for the transcriptions. The CD... features her touring band as well as guest appearances by Dolly Parton, Levon Helm and Garth Hudson of The Band... equally exciting for Jones was the participation of drummer Levon Helm and accordionist/ organist Garth Hudson. A big fan of The Band, she brought the pair in to help her finally nail "What Am I to You," her tune that had been recorded previously but never felt quite right about. "They got it on the second take," she says, "which was so great because they had just learned the song. It was real special. They're really great people." New Band painting by Shawny Marengo. Producer/writer/programmer/musician Tim Gordine, who worked with Robbie in the '90s, now has his own website, timgordine.com, up and running. MD: What about the classic groove Charlie plays? In fact, both of you do it. It's where you're playing backbeats with your left hand and 8th notes with your right, but you lift the right hand off of the hi-hat on 2 and 4, leaving room for the arc of the left hand hitting the snare. Jim: I saw Levon Helm do that with The Band in the early '70s. It sounded better to just sometimes have the snare by itself on the backbeat without the hat. I think Charlie and Steve Jordan are the only other drummers I know who do that today. When I first started doing that, I noticed it tweaked the groove just slightly—enough to make me want to keep doing it. Thanks to Jonathan Katz for sending us this one. Added Robert Palmer's 1991 interview with Robbie Robertson from Rolling Stone. Thanks to Niels Amond Adsersen for typing in this one for us. 50+ new links to Band-related stuff on the net, submitted by "Brown Eyed Girl." Some Jim Weider Band news! We're all going to miss Albert Rogers and his family -- he's moving back to North Carolina. 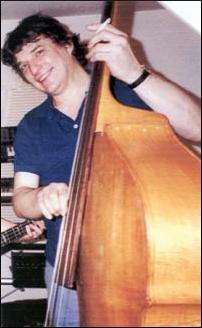 A great bassist/singer and friend. We want to welcome in our new bass player Mike Kemp, you can come out to see him play at Bodles Opera House this coming Friday 19th , it should be a high energy gig with special guests sitting in! All the JWB members want to thank everyone for their true support and wish all Happy & Healthy Holidays!! 12/19/2003 - Jim Weider Band - Bodles Opera House - 39 main st. Chester, NY - 845-469-4595 - 2 Sets - 8:00pm. Our CD's, Videos and DVD's are available by calling toll free (800) 937-3397, or online with CDFreedom.com (all major credit cards accepted). WFUV-FM (Fordham University Radio, New York City) 90.7 FM has a feature on Rick Danko on the John Platt "City Folk Sunday Breakfast" on Sunday morning, December 14th between 8-11 AM. WFUV also has streaming on the web (wfuv.org). Reminder: Garth and Maud Hudson are playing three concerts in Ontario, Canada, this weeked, starting at the MacLaren Art Center in Barrie tonight. See below for details. Garth Hudson, legendary keyboardist with The Band and Bob Dylan, will be performing three intimate concerts with his wife Maud Hudson as part of Peter Swanek's special Peter's Players Keyboard Masters series on Dec 12, 13th and 14th, 2003, Hosted by Lance Anderson, these performances will be an incredible and once-in-a-lifetime opportunity to hear one of the world's most unique and gifted pianists and organists as if in your own living room. (In fact, the concert on Sunday Dec 14th is in Peter's living room!). The concerts will explore Garth's interest in all forms of North American roots music: From gut-bucket Blues and barrelhouse boogie to sanctified Gospel. From Harlem stride and swinging Jazz to Rock 'n Roll, These two fabulous and world renowned artists cover it all authentically but always with the imprint of Garth's inventive genius. They will also perform special tributes to fallen Band members with new unreleased versions of The Band material. The Anderson/Sloski organ and drum duo with special guest Mitchell Lewis (guitar) will perform an opening set and will celebrate the release of their new CD, 'Footwork'. (Make it Real Records/Fusion 111 Dist). They will also join Garth and Maud for a two keyboard-powered wrap-up to these special nights. This is a master. This is the series. These will be nights to remember, so get your tickets early. Tickets are already being sold. * This will be a food drive for the Local Food Bank, donations welcomed. Today, it is four years since we received the sad news that Rick Danko had left us. You may want to revisit the old guestbook from that day and the days that followed -- the response from Band fans on the net was overwhelming. Added lyrics for the beautiful Rick Danko/ Tom Pacheco song "If I Should Fail" from Jubilation. Included a page for the Colin Linden compilation Sad & Beautiful World, 1975-1999, featuring several members of The Band. The album is dedicated to Rick Danko. Added photos of Levon Helm listening to playback of rough mixes for School for Fools, Dubway Studios, New York City, 04.02.2002. Contributed by Jeff Alexander. The great Drive-By Truckers from Alabama have recorded a tribute to Rick Danko and Richard Manuel, titled "Danko/Manuel," for their new album to be released in 2004. The lyrics are available at this site, courtesy of Jonathan Katz. What is he up to this year? There's a new, nice article titled "Life's a carnival for Garth Hudson" in the online newspaper simcoe.com, about Garth and Maud and their shows in Ontario next week. New photos from yesterday's concert with Levon Helm and friends in Easton, PA.
Added a photo from September this year of Levon Helm with the great Garland Jeffreys. For more about singer-songwriter Jeffreys, see his excellent web site. 50 new links to Band-related stuff on the net, submitted by "Brown Eyed Girl." Levon Helm's sister Modena Cagle passed away this week. Obituaries can be found at the funeral home web site and in the Northwest Arkansas Times. Our deepest sympathies go out to Mr. Helm and the family. Garth Hudson recorded a few tracks with Norah in April 2003. Garth and Levon recorded again with Norah on two songs last Thursday. One of those songs is a blues that was recorded in two versions, with Maud Hudson sharing vocal duties with Norah. Norah Jones has now canned 18 songs, recorded at Allaire Studios (located on a mountaintop near Woodstock, New York,) of which 12 will be selected for her next CD. A quote from Maud Hudson: "Norah Jones is one of the sweetest, purest souls anyone could hope to meet... let alone to work with. May she have great success throughout her entire future. She blesses us all." Levon Helm did session work with Norah Jones this week, for her new album to be released in 2004. Garth Hudson will also be present on the CD, he recorded with the lovely Ms. Jones in April this year. Added new, promotional video clips for the instructional videos Rick Danko's Electric Bass Techniques and Levon Helm on Drums and Drumming. Thanks to Dag Braathen for sending us links to these. Added a page for the new Band bootleg Birth. Contributed by Hideki Watanbe. The latest issue of Rolling Stone magazine has a list of the 500 greatest albums of all times. Our boys are at #34 (Music from Big Pink, #45 (The Band) and #291 (The Basement Tapes). Jim Weider's guitar instruction video Get That Classic Fender Sound is now available on DVD (signed by Jim) from Homespun Videos and from CDfreedom.com You may also order the DVD by calling 1-800-937-3397. We have downloaded a little video clip from the DVD. 30 new links to Band-related stuff on the net, submitted by "Brown Eyed Girl." Added/ updated pages for the compilations Masters of Rock (The Band, 1975) and Grooves Volume 13 (Various Artists, 1996). Thanks to Andy Young for the contributions. Added a 1963 photo of Robbie and Levon with Ronnie Hawkins. We previously had this photo in a smaller version. Thanks to "Brown Eyed Girl" for the new scan. Added high-res scans of cover art for the European release of Garth Hudson's album The Sea to the North, the Japanese release of Remedy from the Jim Weider Band and the Dixie Hummingbirds' Diamond Jubilation, featuring Levon Helm and Garth Hudson. Contributed by Niels Amond Adsersen. John Harris' article about The Band and the Basement Tapes in the December 2003 issue of Mojo magazine is one of the better pieces on The Band -- particularly following their influence through to later work by The Beatles, The Rolling Stones, Fairport Convention, Traffic, Manfred Mann etc. Harris' original new interviews with Robbie and Levon are available in full on his own website. Thanks to Peter Viney for sending us the link. The November issue of Woodstock Times has an article about Eric Andersen and Garth and Maud Hudson. Added Skeeter Davis' 1972 album Bring It On Home to the list of albums with cover versions of Band songs. Thanks to good ol' Peter Viney for the info. Check out Peter Stekel's recent photos of The Band's Shangri-La Studio located at Zuma Beach in Malibu, CA. New MPEG-3 audio file with Levon Helm singing "Steppin' Out" (4.1 Mbytes), from the sessions for Eric Clapton's 1975 album No Reason To Cry. The track is available on several bootlegs. Thanks to Johnny Gundersen for sending us this one. The Stapletons and guest artists will pay tribute to The Band's farewell concert "The Last Waltz" on Wednesday, November 26, 2003 at The Southgate House, Newport, KY. Doors open at 9 p.m. Ages 21+up Cover is $7. Concert goers who bring a canned good, which will be donated to the Freestore Foodbank, will receive an $1.00 off. In celebration of the 27th Anniversary of the farewell concert, The Stapletons have assembled some of the best local and regional talent for this tribute. This will be an unbelievable night of outstanding music for all! For additional information, send e-mail to mail@thestapletonsusa.com or go to http://www.thestapletonsusa.com. 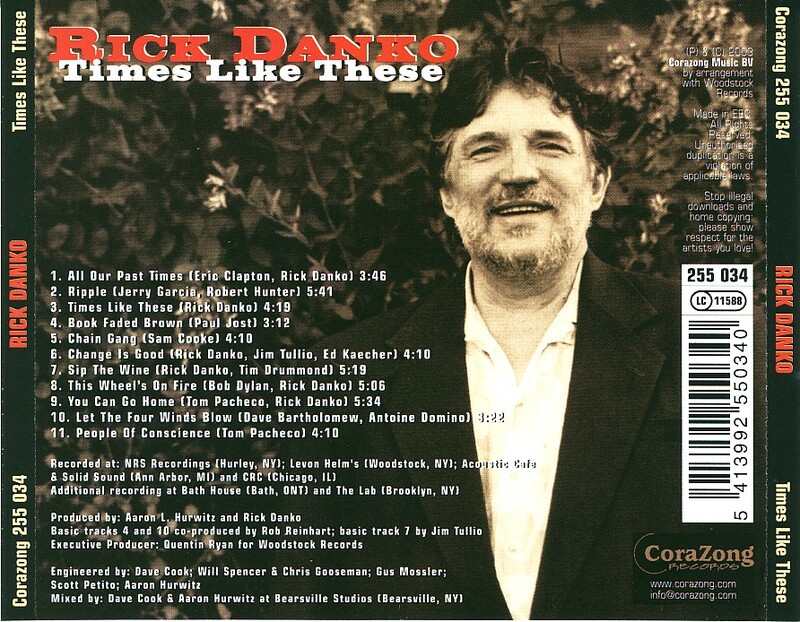 Added scans of the front and back cover of the European 2003 release of Rick Danko's Times Like These. Contributed by Niels Amond Adsersen. New photo of Dylan, Danko and Helm back stage at the Lone Star, NY, gig, February 1983. Added new chords for the song "Christmas Must Be Tonight." Contributed by Johan Kristell. Added a concert poster for the gig with Levon Helm & Friends in Easton, PA, 11.29.2003. "Hey Rick Danko wherever you are, I can hear your voice from beyond the stars." Ricky, Garth, Levon and Jimmy Weider all recorded with Linden during the '80s and '90s. 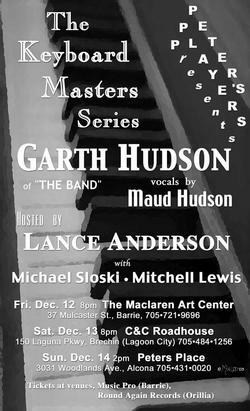 Garth and Maud Hudson will be performing with Lance Anderson in Ontario in December. See the concert list for details. Added an article about Richard Manuel, copied from a local e-zine in his home town Stratford, Ontario. The article has some strong language, and includes detailed directions to Richard's grave marker. Thanks to David Fisher for sending us the link. Garth and Maud Hudson, with special guest Erin Hill, will give a concert at The Point in Bryn Mawr, PA, on Saturday November 8. Tickets for the concert can be ordered from here. Besides new surprises, Garth and Maud will be performing material from their soon-to-be-released (2004) live CD! Garth and Maud are also playing with "Eric Andersen and Friends" at the Colony Cafe in Woodstock, NY, on Friday November 14. See the concert list for details. Even the most devout atheists will be moved to shout "Amen!" by this rousing gospel album. It honors the 75th (diamond) anniversary of the Hummingbirds, the choral group organized in Greenville, S.C., by James B. Davis, then 12. Davis himself is now lead singer emeritus, but Ira Tucker Sr., who joined the group in 1938, when he was 13, now fronts the Birds with grace, style and a still-vigorous baritone with shades of Johnny Cash. William Bright's wailing lead on "Too Many Troubles" is a lesson in how Christian music influenced the blues and ultimately all of American music. Other highlights include "God's Radar," a high-tech gospel song whose zydeco arrangement provides a showcase for Garth Hudson's accordion, and the Grateful Dead farewell song, "I Bid You Goodnight." The Birds don't need a lot of frills to get their message across. If nothing else, their time-tested style is a tribute to the virtues of directness and clarity. A nice video clip from a July 2002 TV interview with Garth is available from Toronto's Pulse 24 web site. Thanks to Jonathan Katz for pointing us to this one. Finally: "The Band: The Robbie Robertson Interview", from Musician magazine, May 1982. Extensive interview with comments from Helm and Danko, The Band bio, discography and more. Thanks to Niels Amond Adsersen, Rene Aagaard, David Zuck, Ian Olvera, Susan Hill, Kelly Otto and "Empty Now" for helping out with this one. Enjoy. More photos by "Brown Eyed Girl" from the concerts with Quill & Tolhurst with Garth, in Toronto, 10.23.2003, and Eric Andersen, Garth and Maud Hudson in Toronto, 09.14.2003. More links to Band-related stuff on the net, submitted by "Brown Eyed Girl". "Dixie Hummingbirds' latest a glorious delight"
"Courier Press: Entertainment Music Reviews"
Director Bob Smeaton was live on the UK BBC show Radio 5 Live this afternoon, Oct 31st, and was discussing the making of the recently completed Festival Express, featuring the Dead, The Band, Janis Joplin and others which is to be screened tonight in London at Leicester Square, at 11.30 p.m, to D.J Simon Mayo. He talked for a good 10 to 15 minutes on his work on the film project and his previous work such as the Beatles anthology and the Who, Hendrix and the Stones. What was of interest was that he noted that the film would not be shown nationally (and not in large cinemas ) until next spring at the earliest and that a soundtrack and DVD would follow, with the DVD possibly having more film footage and songs than the existing film which has a time of 96 minutes. He also noted that the film captured the moment of the 70s rock festivals and that it was a unique event. Added more session photos from the recording of the Larry Thurston/ Jeff Alexander album School for Fools, featuring Levon Helm on drums. Also included some shots from a photo session for the CD cover. Thanks to Jeff Alexander for the contribution. New MPEG-3 audio file with Rick Danko singing "Hard Times" (8.1 Mbytes), from the sessions for Eric Clapton's 1975 album No Reason To Cry. The track is available on several bootlegs. Thanks to Johnny Gundersen for sending us this one. More links to Band-related stuff on the net, submitted by "Brown Eyed Girl. Who bought and set up the Danko and Manuel domains? Added photos of Ronnie Hawkins and the Hawks on stage, ca. 1959, The Band on the cover of Circus, 1970, and a signed '70s Band poster. Contributed by Curt Copeland. New photo by Pat Brennan of Levon with booking agent Jim MacNamara in Chicago, 1983. In the new issue of Vanity Fair, there is a full page picture of Robbie Robertson and Ronnie Hawkins with the heading "The Back-Roaders". This is Vanity Fair's annual music issue -- Norah Jones and Willie Nelson are on the cover with others. A tip of the hat to "Bones" for sending us info about the photo and to "Brown Eyed Girl" for the scan. Levon Helm w/band are playing at the Rams Head Tavern in Annapolis, MD, on Thursday, October 30th. See the concert list for details. Thanks to Jamie Green for the tip. "My mom and dad have been gone a long while... They both loved gospel music, and I'll tell you what, I never thought about them more than when we were making that record. I felt they were right there in the room watching us. I could hear my mom saying, 'Now you're finally making a little music, son.'... And it felt like they had a hell of a crowd with them, listening in." The quote is from the article "New nectar for Hummingbirds' flock" from today's Philadelphia Inquirer. I hope everyone will be able to make it the State Theater in Easton, PA, on Saturday November 29th, for the 40th Anniversary Concert for the Red Mill Museum in Clinton, NJ. The current line up for the show is the great Levon Helm and friends, bluesman Cory Harris from Alligator Records and Clinton's, NJ, hometown band The Matt Angus Thing. Wait till you hear Matt's version of "The Weight," it's unbelievable. This is a great band -- Levon, Garth and Rick have all worked with them. Nov. 29, Saturday night at 8 pm. Tickets $30.00 and $40.00. Call (610)252-3132, (610)991-7828 or the Red Mill Museum at (908) 735-4101 or visit www.statetheater.org. New b/w photos from the concert with Garth and Maud last Sunday. In the new issue of Vanity Fair, there is a full page picture of Robbie Robertson and Ronnie Hawkins with the heading "The Back-Roaders". This is Vanity Fair's annual music issue -- Norah Jones and Willie Nelson are on the cover with others. A tip of the hat to "Bones" for sending us this info. Added a concert poster for the 10.23.2003 Quill & Tolhurst gig with Garth and Maud Hudson. Thanks to dear Maud for sending us these posters. Oslo's biggest R&R-venue, Spectrum was packed this monday, to receive His Bobness. An audience aged 15 -70. And we loved it. To Be Alone with You opened the concert. Bob on harp & piano, Larry Campbell & Freddie Coella: guitars, Tony Garnier; bass and George Recile: drums. Well, his voice is not soft. And his instrument are treated maliciously at times, but he has a mean attitude. The songs are his, and they are outstanding. Bob keeps the music alive by rearranging and changing melody, time and arrangements. Several times I only recognised the songs by the lyrics. And such a string of pearls: It's All Over Now, Baby Blue, Desolation Row, Boots of Spanish Leather, Highway 61 etc. The band was rocking. I can't imagine any band of hungry youngsters to rock an roll better than this gang of grown men! We had a swell time. I have never seen him live before, and this I regret. He left the stage after two hours... and returned to speak to us!!! Introducing the band members. The encores were Like A Rolling Stone, Forever Young and All Along the Watchtower. Which left nothing more to be said. Bob and his men stood side by side on stage to receive the applause. No comments, no thank you's, no goodnight. Of course. We are the ones to say thank you. Added a photo from last Saturday of Levon and fan Gary Palmer. Photo by Joe Lore. Garth Hudson are playing with Greg Quill and Kerryn Tolhurst at a CD release party in Toronto on Thursday, October 23. Quill and Tolhurst are founding members of the seminal Australian country rock bands Country Radio and the Dingoes -- Garth played with the Dingoes in the '70s, appearing on their 1977 LP Five Times the Sun. See the concert list for details about this gig. 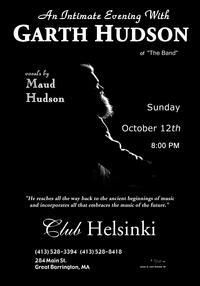 Reminder: Garth and Maud Hudson will give a concert at the Club Helsinki in Great Barrington, MA, on Sunday October 12. More scans of John Hammond's '64 single "I Can Tell"/"I Wish You Would", featuring Ricky and Robbie. Thanks to our Danish friends René and Niels for the contribution. Included some WireImage photos of Robbie from last month. Added the concert poster for the upcoming gig (FREE to the public) with Levon Helm & the Last Hombres in Huntington, Long Island, on October 11. See the concert list for more info. about this event. The Jim Weider Band are playing an acoustic/ electric show at La Cazuela in Northampton, MA, on October 15. See the concert list for details. The November issue of the UK music mag Uncut comes with a CD titled Strange Currencies, with songs picked by R.E.M. The first track is The Band's live version of "Don't Do It" from Rock of Ages. Thanks to Peter Viney for sending us cover scans. "And as far as Levon or Garth, you know, these are -- you know, we grew up together. These are my brothers. And I love them dearly. I don't have any of these problems, you know. I think the world of them. I just don't want to necessarily work together, you know, like we were. And I've worked with Garth over the years, you know, on solo projects I was doing, film things. The same thing with Rick and with Richard. So on my part, there's no bitterness. There's no nothing. You know, it's all fine with me." Thanks to "Brown Eyed Girl" for the links. From the Rolling Stone archives: "Watkins Glen Jam Tops Woodstock; 600,000 Fans -- Dead, Allmans, the Band bring summer festival back home". Thanks to "Brent" for sending us this link. Added a photo of Ricky's grave in Woodstock. More good links to Band-related stuff on the net, submitted by "Brown Eyed Girl." Included are pages dedicated to Richard Manuel and Rick Danko , where you can "leave flowers on their graves." Garth Hudson and the rest of Burrito Deluxe, with former members of Gram Parsons' Flying Burrito Brothers, are playing at the Mercy Lounge in Nashville, TN, on Sunday, October 26th. See the concert list for details. Warner/Rhino has just released a two disc abbreviated version of the 4-CD box set The Last Waltz at about half the cost. This set doesn't include the bonus material, presenting instead just the 30 songs that were included on the original 3-LP release from 1978. It does, however, feature the same remix & remastering upgrade used for the 2002 box set and comes with a booklet containing photos & liner notes by David Fricke. See the Rhino web site for more about this release. Thanks to David Powell to for posting this info. in the "Band Guestbook". Levon Helm & the Last Hombres had to cancel their appearance at the recent Americana Music Awards in Nashville, TN, where Levon also should have been presented with the "Lifetime Achievement Award For Performer" that he won this year. The cancellation is due to serious illness in Levon's family. All new scans of artwork contributed by Niels Amond Adsersen. Levon Helm won the "lifetime achievement award for performer" at the Americana Music Association's 4th annual conference in Nashville, TN, this weekend. Among the other prize winners were Johnny Cash (song of the year for "Hurt"), Kris Kristofferson (Spirit of Americana Free Speech Award), Gram Parsons (president's award), Sam Phillips (lifetime achievement for executive) and John Prine (lifetime achievement for songwriter). Congrats, Levon! And thanks to Joe McSpadden for the news update. Added an MPEG-3 file with The Band's live performance of "Up on Cripple Creek" (6.1 MBytes) at the Ed Sullivan Show in 1969. Thanks to Curt Copeland for sending us this one. New photos by "Brown Eyed Girl" from the concert with Eric Andersen and Garth and Maud Hudson in Toronto last Sunday. There's a great review in the latest issue of Living Blues magazine, of the Larry Thurston/ Jeff Alexander album School for Fools, featuring Levon Helm on drums. Rick Danko is among the guest artists on the "new" Gene Clark compilation Under the Silvery Moon. Big Foot, 1999 solo album. Rockabilly Guitar Vol.1 and Vol.2, a video featuring Levon Helm and Rick Danko playing with Jim as he teaches the classic grooves that started rock-n-roll and influnced The Band! Get That Classic Fender Sound, video with the electric guitar licks and styles of the greats. Basic Licks and Classic Solos for Electric Blues Guitar, video. Added more information about the new film Festival Express, including scans of the program leaflet for the film at this years Toronto Film Fest. Thanks to "Brown Eyed Girl" for sending us the scans. One of music's true heroes left us on September 12, 2003. Rest in peace, Johnny Cash. Added Patti Smith's 1974 review of Planet Waves. Anyone with too much spare time and good typing skills? If so, please e-mail me first, so we can divide the task between the volunteers. The Toronto Star had an article on September 11 about the newly released film Festival Express, featuring performances by Janis Joplin, The Band and the Grateful Dead. The film will be available on DVD in the spring of 2004, according to Ken Walker, one of the Toronto promoters behind the 1970 Festival Express concerts. Thanks to "Brown Eyed Girl" for the information. "Hudson considers Burrito Deluxe an ongoing venture and hopes to record with them again. He'll have to squeeze it in with the multitude of other projects he's working on, including a live album and a follow-up studio album to his 2001 solo disc The Sea to the North. The Rock and Roll Hall of Famer enjoys steady demand as a session player and cites recent projects with Norah Jones, the Dixie Hummingbirds, Martha Wainwright, Teddy Thompson, Eric Andersen and Tom Rush." The Band web site was off-line most of yesterday and this morning, due to installation of a new telephone central at the college where the server is located. Added an MPEG-3 file with singer/songwriter Jack McTamney's unreleased cover version (4.6 MB) of the Dylan/Danko song "This Wheel's on Fire," recorded in 2002. Downloaded from the Jack McTamney web site. Rest in peace, Warren Zevon. Included the 2001 4-CD set Oh What a Feeling 2 in the list of various-artists albums. Thanks to Sadavid for the album info. Added a photo of Levon Helm with Jane Fonda in the 1984 film The Dollmaker. Scans by Jonathan Katz. Professor "Louie" & the Crowmatix with Mike Falzarano of Hot Tuna, & The Rock of Ages Horns with Tom "Bones" Malone, are playing "The Music of The Band" at the B.B.King Blues Club in New York, on Tuesday, September 23. Also, on Saturday September 27th, Professor "Louie" & the Crowmatix will be playing with "The Flying Other Brothers" (Pete Sears, Jimmy Sanchez, Barry Sless) at the Legends Restaurant in Woodstock, NY. See the concert list for details about these two gigs. The Friday edition of the Toronto newspaper The Globe and Mail had an article about the new film Festival Express from the 1970 Canadian tour with The Band, Janis Joplin, The Grateful Dead, et. al. A 1961 recording from Hallmark Studios in Toronto, with an 18-year old Rick Danko and a 21-year old Levon Helm backing up young jazz guitarist Lenny Breau, has finally been released on a CD titled The Hallmark Sessions. Thanks to Reg Schwager for the news. Included a scan of a backstage pass from a 1983 Band gig. Contributed by Pat Brennan. Added cover art and updated the info. about the 1993 promo The Band CD single "Atlantic City." Hm. I knew I had seen that name before. The author of the (IMHO) unfortunate article about Ricky's problems, mentioned here yesterday, sent us something last year that we archived in the "library" section, titled "The Eternal Mysteries of The Band (In Hopes of Eliminating Every Last One)." Added the CD sets After the Waltz and Club Quattro, Tokyo 1994 to the bootleg discography. Added two pics from the late '90s of Rick Danko with the Last Hombres. Levon signing the local "Walk of Fame." The on-line music mag Perfect Sound Forever has a new article about "Rick Danko's Later Years," focusing on his health problems and other negative sides of Ricky's life and career. It's written by yet another "fan" that bought the "Band mythology" and the BS from Greil Marcus and TLW and what not, and then developed problems with facing reality. We've seen it before (Hoskyns' Danko obituary, all the crap in the old GB, that madman in the Dylan newsgroup, the Levon-hater in alt.music.the-band, etc. ), and we'll see it again. The article is rather nasty, speculating about causes of death and tragedy, without concern for those left behind, so you may not want to read it. If you do, though, go here. Levon Helm & The Last Hombres are playing a benefit concert in Amagansett, NY, tomorrow, Thursday August 28th. See the concert list for details. Added the article "The Half-Breed Rides Again" from Time Magazine, November 1987, about Robbie's debut album. Contributed by "Brown Eyed Girl." In the summer of 1970, a series of music festivals were held across Canada. After the first concert in Toronto, the musicians, roadies and a film crew boarded a private train to travel to the remaining events in Winnipeg and Calgary. The Festival Express was the brainchild of two brash, young promoters named Ken Walker and Thor Eaton. Not satisfied with assembling one of the most incredible travelling concert bills in history (performers included Janis Joplin, the Grateful Dead, The Band, the Flying Burrito Brothers, Eric Andersen, Buddy Guy, Great Speckled Bird, and many more) Walker and Eaton decided that "packaging" the tour in the form of a CN railcar moving across the vast landscape would make for good times and good music. How right they were. At the crest of the musical and social explosion that was the sixties, this contrast between the greatest musicians of their day (and, arguably, any day) and a leisurely mode of travel made for a combustible bell jar that vibrated with artistic camaraderie. They rocked, they rolled, they jammed -- all part of a bacchanal that chugged its way across the Canadian Shield and all documented on film. The performers were confronted at every concert stop by protesters angry about the $14 ticket price ("Free the music -- the music should be free!") but this did not prevent them giving their all for the thousands who flocked to see them. This never-before-seen footage (in which Willem Poolman, father of producer Gavin Poolman, captured performances both on stage and onboard the train) reminds us of the sheer electricity performers like Joplin were capable of creating. The footage was lost in legal proceedings for years, but ninety hours of raw negative and forty hours of uncut sound recording fortuitously found their way to the Budge Crawley vault in the National Archives of Canada. With music mixed by Eddie Kramer (producer of Jimi Hendrix, Led Zeppelin and Santana), Bob Smeaton.s documentary immortalizes performances that -- in comparison to those found in the controlled set-ups of most concert films -- are unmistakably raw and immediate. Festival Express is more than the sum of its extraordinary parts; it captures a uniquely Canadian experience and the spirit of an age. Bob Smeaton is an established director of musical documentaries featuring such performers as The Beatles, The Band, The Who, Meatloaf and Genesis. He was the series director on ABC's award-winning The Beatles Anthology (95) and directed an episode of the VH1 series Classic Albums (97) that chronicled the making of The Band's self-titled 1969 album. Festival Express (03) is his latest documentary. "In the summer of 1970, music legends Janis Joplin, The Grateful Dead, The Band, and Buddy Guy, among others, piled into a train with their instruments and left Toronto for a five-day music festival tour. Bob Smeaton's Festival Express, a world premiere, chronicles the journey and captures all the raunch and debauchery of this cross-Canada rock odyssey." 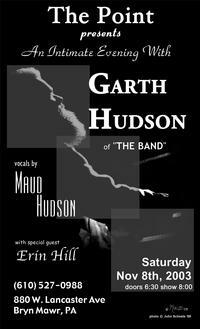 Garth Hudson will perform with Eric Andersen at Hugh's Room in Toronto, Ontario, Sunday September 14, 2003. Maud Hudson will join in on a few songs. The concert is part of the the Toronto Film Festival and marks the release of the concert film Festival Express, from the legendary 1970 tour with The Band, The Grateful Dead, Delaney and Bonnie and Friends, Ian and Sylvia, New Riders of the Purple Sage, Tom Rush, Buddy Guy, Eric Andersen, Mountain, Ten Years After, Traffic, Seatrain, Charlebois, James and the Good Brothers, Cat Mashmakan and The Modern Rock Quartet. See the concert list for details. New photos from August 2003 of Adela Calbillo at Rick Danko's grave and Levon with Laura and Adela at a gig in Pawling, NY, added to the page with photos of Band fans. More links to Band-related stuff on the net, and a 1983 photo of Robbie, on the cover of Bam magazine. Submitted by "Brown Eyed Girl." Added a 1972 article from Creem magazine, about Robbie's songwriting. Thanks to "Brown Eyed Girl" for sending us this one. A bunch of photos of the Jim Weider Band and Professor "Louie" & the Crowmatix at the Woodstock Summer Bash, 08.02.2003, are available from boxoflight.com. Thanks to Tom Moretti of Woodstock Records for sending us the link. Scans and information contributed by Hideki-san. More information and cover art added for the 4-CD Dylan/Band basement tapes bootleg A Tree With Roots. A new "box set" edition of this boot came in 2002. Thanks to Niels Amond Adsersen for sending us scans. More photos by Ed Voci of The Jim Weider Band and Professor "Louie" at the Woodstock Summer Bash, 08.02.2003. Garth Hudson plays on Norwegian folk musican Hallvard T. Bjørgum's new album Free Field -- a fascinating CD that mixes rock with traditional and ancient music. Garth is joined by Blondie Chaplin (Beach Boys, Rolling Stones, The Band) and Eric Andersen on Free Field. Added the album Without You (Jesse Harris, 2002) to the list of albums with cover versions of Band songs. Album info. contributed by Jun Yamaya. Pat Brennan, a musician and long-time contributor to The Band web site, is playing on the new album The Executioner's Last Songs Vol. 2 & 3 from Jon Langford's Pine Valley Cosmonauts. The Cosmonauts have covered The Band's "Whispering Pines" earlier (with Kelly Hogan on Beneath the Country Underdog). This time they do a version of "Long Black Veil", a song The Band themselves covered on their debut album. See e.g. the All-Music Guide for a review of The Executioner's Last Songs Vol. 2 & 3. Levon Helm and the Last Hombres will be playing a benefit gig for Alejandro Escovedo at the The Mercury Lounge in New York City on September 3. See the concert list for details. The Dixie Hummingbirds' new gospel album Diamond Jubilation, featuring Levon Helm, Garth Hudson and musicians from Bob Dylan's touring band, will be released by Rounder Records on October 7th. A new DVD with musical performances from Saturday Night Live has just been released. It includes The Band doing "Dixie" in November 1976. More gig dates for The Last Hombres with Levon Helm. New photo of Levon with the Last Hombres in Woodstock, June 2003. Added the album One Step Closer (Kenny Neal, 2001) to the list of albums with cover versions of Band songs. Rufus Wainwright's new album Want One, featuring Levon Helm on drums, will be released next month. Ed Doadt just sent us some information about how to find Richard Manuel's grave at the cemetary in Stratford, Ontario. If you go there you will need the directions -- the Avondale cemetary is huge. When we went to Stratford a few years ago, we were lucky that we found the grave at all (actually, we just drove around a little, stopped the car, walked out and stepped right on Richard's stone...). Added an interesting painting by Shawny Marengo, of The Band... and The Band... and The Band. New photo from March 2003 of Garth and Maud Hudson with the band Yesterday's News (who just got their own web site and some sound samples on the net, btw). Added a funny little photo of Ricky in Japan in 1978. New fold-out photo from Vanity Fair of all the artists at the "Salute to the Blues" concert at New York's Radio City Music Hall in February 2003, including Levon Helm. Scans by Mark Atkins. It's Garth Hudson's birthday today. Happy birthday, Honey Boy! Scans and information contributed by our Japanese friend Hideki Watanabe. Added pages for the 1968 Levon and The Hawks promo 7" "Go Go Liza Jane", the 1994 Band promo CD Up Close and the 2002 Geoff Muldaur compilation Shiver Me Timbers!, featuring Garth Hudson. Scans and information contributed by Hideki Watanabe. Barney Hoskyns' 1993 The Band biography Across the Great Divide was reissued in a revised/expanded version by Pimlico in the UK this month. The update consists of Hoskyns' 1998 Levon Helm interview from Rolling Stone and his rather disrespectful Rick Danko obituary from MOJO magazine, 2000. The three '90s Band albums are mentioned in the interview, but that's it. The book's discography has not been updated -- and there are no references to The Band web site. Thanks to Niels Amond Adsersen for sending us book cover scans. Included the LP Mr. Funky (The Roy Young Band, 1972) in the list of albums with cover versions of Band songs. Thanks to Peter Leach for sending us information about this one. We just received this review in German of Garth Hudson's solo album The Sea to the North. A long time ago we used to speak a little German, but now we need help with translating the review correctly. Anyone? Evidently, Garth's CD is selling well in Europe now that Evert Wilbrink at Corazong Records has released it here. New poster for the 08.02.2003 "Summer Bash" in Woodstock, with the Jim Weider Band and Prof. "Louie" and the Crowmatix. Added a photo of Garth Hudson and Kris Kristofferson at the Ronnie Hawkins tribute concert in Toronto in October last year. Replaced the link for Hüsker Dü in the list of related artists. On 07.13.2003, the Hudson Valley newspaper The Daily Freeman ran an article about drummers in the Mid-Hudson area, with emphasis on Levon Helm. 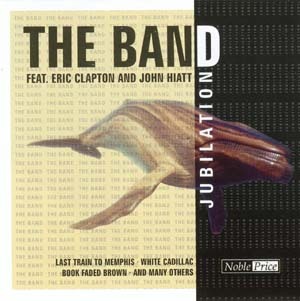 The Band's 1998 studio album Jubilation was released in Europe by The International Music Group AG, Germany, in April 2003, with new cover art. In this month's Vanity Fair there is a large spread photo from the "Salute to the Blues" benefit concert at New York City's Radio City Music Hall in February 2003, with Levon Helm along with Martin Scorcese, Mavis Staples, Dr. John, and many others. New photo added to the Band fans page, of Levon with "Ozone" and friends, NJ, September 2002. Added bass and guitar tablature for "The Night They Drove Old Dixie Down." Contributed by "Empty Now," who created it using Guitar Pro 4.0 , a very fast and convenient tool for writing tabs. Garth Hudson is currently recording a few tracks for The Gypsy Kings' new CD. The recording crew are Craig Street (producer), Husky Hoskulds (engineer) and "Matt C" Cullem (assistant engineer). Added more information about the 1977 drawing of Bob Dylan and The Band from the Dutch picture book Island of Nose. Thank to "Ragtime" for this one. There's a new The Band discussion forum on the net: A Band guestbook has been started by Tracy R. Nice one Tracy, good luck to you and your helpers. The new GB is hosted by a commercial ISP, so you may want to turn off pop-up windows in your browser before going there. New photo of Levon Helm and the Barn Burners (w/Amy Helm) in Fayetteville, AR, 06.28.2003. The June 2003 edition of John's Blues Picks from Mapleblues magazine includes interesting reviews of the latest CD from Ronnie Hawkins, featuring Levon and Robbie, and a new Johhny Cash tribute album that involves Colin Linden, Richard Bell, Jim Weider, the Staples and "Long Black Veil". Added a 1977 drawing of Bob Dylan and The Band. Contributed by Charlie Young. Included a page for yet another Robbie Robertson Red Boy promo disc. Scans and information contributed by Hideki Watanabe. It's Robbie Robertson's 60th birthday today. Happy birthday! Scans contributed by the fabulous Hideki Watanabe. Tonight, Friday July 4, from 10:00pm to 11:00pm, Garth Hudson's CD The Sea To The North will be played in it's entirety on the Friday Night Album Hour at WKZE-FM 98.1 in Sharon, CT. The program is hosted by musicologist and internationally published music writer Frank Matheis. Matheis presents the highly acclaimed roots, blues and eclectic music program entitled Frank's Picks every Friday evening from 7 to 10, and then selects the WKZE Album of the week for the Friday Night Album Hour from 10 to 11. 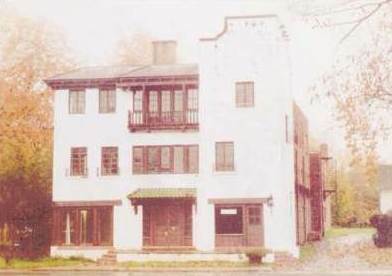 The WKZE Broadcast Center is located in the historic village of Sharon, Connecticut, one and a half hours north of New York City. They broadcast to an area covering southern Berkshire County, Mass., Litchfield County, Conn., and New York's Hudson Valley extending to just south of Albany and well into the Catskills. Added a video clip (3.8MB) with Rick Danko performing "Stage Fright" at Madison Square Garden in 1979, with Paul Butterfield, Blondie Chaplin and touring band. The video is stored using Microsoft's Windows Media Video (WMV) format, the quality is poor. Contributed by Emanuele "The Beard" Marchiori. The master tapes used for producing the live album from the 1969 Woodstock Festival are now for sale. The Band's complete set is included on the tapes. Garth and Maud Hudson are currently in the studio recording for blues singer Peach. Peach is working on her third album which Marty Grebb is producing. Players on this album include Garth Hudson (accordian, organ), Amos Garrett (guitar), Reggie McBride (bass), Maria Martinez (drums), John Molo (drums), Gary Mallaber (drums), James Gadson (drums), Danny Timms (keyboards), Marty Grebb (keyboards, saxophones), Jimmy Roberts (saxophone), Cece Worrall (saxophone), Lee Thornburg (trumpet), Johnny Lee Schell (guitar), Paulie Cerra (saxophone), Lynn Keller (bass), Earle Mankey (engineer). The unstoppable Adela Calbillo is at it again. Take Your Partner by The Hand - 2 x 12"
Contact from the Underworld of Red Boy - 12"
Tickets for the "Summer Bash" at the Woodstock Playhouse, Woodstock, NY, 08.02.2003, featuring The Jim Weider Band and Professor "Louie" & the Crowmatix, are now available from ticket outlets in Woodstock, NY, Albany, NY and Kingston, NY. See the concert list for details. The September 2002 issue of the music-technical magazine Mix had an interesting article about the audio production for The Last Waltz. Added a page for the Japanese 3-CD Dylan/Band bootleg Gonna Let You Pass - The 1974 Tour Anthology. Scans and information contributed by Hideki Watanabe. Garth will be playing with Burrito Deluxe in Boulder, CO, on July 12. See the concert list for details. He-hey! It's Garth the viking! Added another video clip (RealVideo) from the recording sessions for the new gospel album Diamond Jubilation by the Dixie Hummingbirds, featuring Garth Hudson, Levon Helm and musicians from Bob Dylan's band. Added photos from the Rock 'n' Roll Fantasy Camp in New York last week, where Levon Helm hooked up with the Who's Roger Daltrey. Yesterday, Robbie Robertson had a star with his name on it added to Canada's Walk of Fame in Toronto, a stretch of sidewalk that winds through the city's downtown theatre district. Here are some photos of Robbie from the event. The Dixie Hummingbirds' version of Bob Dylan's "City of Gold," recorded with Levon Helm and Garth Hudson for their new album Diamond Jubilation, has been included on the soundtrack album for Bob Dylan's new film Masked and Anonymous. Added another video clip (RealVideo) from the recording sessions for the new gospel album Diamond Jubilation by the Dixie Hummingbirds, featuring Garth Hudson, Levon Helm and musicians from Bob Dylan's band. You'll enjoy this one. It's kind of like a music video, in colour this time. Includes several good sequences with Lee and Honeyboy. Copied from the Treasure Records web site. The 08.17.2003 gig with The Dixie Hummingbirds, Levon, Garth and Bob Dylan's band at the Newport Folk Fest has been cancelled. Roger Daltrey, who was one of the stars at David Fishof's (Ringo Starr's manager) Rock 'n' Roll Fantasy Camp which ended Sunday in New York, says he found the experience of being a camp counselor "very humbling"... ...a highlight for Daltrey was meeting his idol, former Band singer-drummer Levon Helm. "I think [he's] one of the ultimate singers and musicians of all time." Daltrey says he first met Helm in 1965 in Belfast. "Opener Gillian Welch... lent her voice to Jones and company's exceptional rendition of The Band's 'It Makes No Difference.'" The new Italian CD Tribute to the Band, with 8 The Band covers by Emanuele Marchiori and friends, is now available from The Beards web site. Maybe I should add some sound samples here so you all can get to hear a bit of the quite amazing "Italian Richard Manuel." Scans and information contributed by Hideki Watanabe. You should check out Hideki's excellent music archives. This coming Saturday night June 28th, the "Nighthawks" radio show on Provincetown, MA's WOMR 92.1, hosted by Bob Reichers, will have an evening with the Band. -- the entire show will be all Band (together and solo). WOMR's "Nighthawks" is on 10:00pm - 1:00am PST / 1:00am - 4:00am EST and can be heard live anywhere in the world by logging onto www.womr.org/listen.html (with improved web-streaming). Added a photo of Rick Danko with Bob Dylan at the S.N.A.C.K. Benefit Concert in San Francisco, 1975. New photos of Garth and Maud Hudson in Toronto, May 2003. Levon Helm and the Barn Burners, with Steve Guyger on harp & vocal, will be touring Oklahoma and Arkansas this week. See the concert list for dates and venues. I wanted you to know that high resolution prints of my paintings now are available for $25 each. They come matted for a frame 11X14 signed on back with a plastic reseable cover. Titles available include "Hear No Evil," "Full Moon Serenade," "Disco Queen" "That Old Time Religon", "Once In A Blue Moon," "How To Have Fun," and alot of others. Anyone also can request a print of another picture and I will produce it for them. Added an article about Levon Helm and the Barn Burners from the June 2003 issue of Hudson Valley Magazine. Thanks to Don Pugatch for scanning this one. Thanks to myself for typing it in and trimming the photos. Levon Helm & The Last Hombres are playing at Leavy's Last Stop Cafe in Huntington Station, NY, tomorrow, Saturday June 21. See the concert listing for details. The Globe & Mail has an interesting article about two young documentary filmmakers - one the son of novelist Michael Ondaatje - and their piece on the Dylan who made the Basement Tapes. The new Bob Dylan cover album May Your Songs Always Be Sung includes Rick Danko's version of "This Wheel's On Fire" from Times Like These. Etown has just released a new various-artists live CD, featuring a 1999 recording of Rick Danko with Garth Hudson and Professor "Louie" & the Crowmatix. Levon Helm & the Barn Burners, featuring the great Steve Guyger on harp & vocal and many other special guests, will be playing in Wagner Park, Battery Park City, New York, on July 21st. Guyger will also perform with the Barn Burners on their upcoming tour of Arkansas and Oklahoma. Added more photos and a travel report from the "pilgrimage" the band Yesterday's News did to Woodstock in March 2003, to see Garth and Big Pink. Amy Helm (Levon's daughter) and her band Ollabelle have just signed a record deal with producer T Bone Burnett's label, DMZ/Columbia. The band's debut album, scheduled for release in early fall, was produced by Steve Rosenthal. Levon Helm & the Barn Burners, with David Johansen and other special guests, will be playing at the Black Potatoe Music Fest in Clinton, NJ, on July 12, 2003. Ollabelle with Amy Helm is also on the bill. Time Magazine, June 16, 2003, has a section called "Great moments in Time". A 1970 pic. of the Band is shown together with a few words. Thanks to Serge Daniloff for sending us a scan of Time. Rearranged the concert dates page a little. The gigs are now grouped by artist. Should make it a little easier to read and navigate. A studio session with Levon Helm and the Last Hombres, recorded in May 2003, will be broadcasted on the World Cafe tomorrow, Wednesday June 18th. The World Cafe with David Dye can be heard on more than 150 stations nationwide. Fans can find their local station by going to their website or they can listen online at 2pm EST or 1am EST by going to xpn.org. There's a nice live cover of "It Makes No Difference" at Shannon McNally's web site. It's available at the bottom left side of the page after you enter her website. There are 6 selections and "It Makes No Difference" is selection 6. Takes a few seconds to load up. Reguires a Flash player. Added a new photo of Maud and Garth Hudson in concert in Toronto in May. The new album For The Sake Of It from the great Dutch blues band Sunset Travelers, includes a cover of The Band's "Get Up, Jake". The guestbook at this site was re-opened yesterday. It took less than 24 hours before we had to close it again, this time for good. Accusations against members of The Band, indicating involvement in serious criminal activities, were posted (and of course deleted) today. The web site editor and his internet provider (a Norwegian college) can not continue to publish material that may cause legal problems. Goodbye, guestbook. Thanks to all you good contributors. New photo of Garth Hudson in Holland with Burrito Deluxe, February 2003. Contributed by Ger Romunde. The Jim Weider Band are playing at this years Montreal Jazz Festival in Canada, 06.29.2003. Added pages for the new Band bootlegs We Will Set You Free and Life Is A Drunkard!. Contributed by Japanese Band-dandy numero uno, Hideki Watanabe. Added a new article by Leland Rucker, titled "Big Pink in Retrospect - How Songs Learn: "The Weight" Hangs Tough at 35". Thanks to Leland for giving us permission to use this one. Levon Helm with the Bennett Brothers will be playing a benefit concert for Cystic Phybrosis at the Xaverian High School in Brooklyn, NY, on June 14. See the concert list for details. The Last Hombres w/Levon Helm will be live on the radio Wed. June 11th at 12 noon, with host Rita Houston, WFUV Public Radio from Fordham University in New York City, the big radio station for Americana music in NY. Live broadcast on the internet from wfuv.org and 90.7 FM. The June 2003 CD repackaging of the first New Riders of the Purple Sage album includes a version of "The Weight" as a live bonus track. Added more audio samples and a video clip (RealVideo) from the recording sessions for the new gospel album Diamond Jubilation by the Dixie Hummingbirds, featuring Garth Hudson, Levon Helm and musicians from Bob Dylan's band. Updated the Band fans page with photos of the band Yesterday's News on their "pilgrimage" to Woodstock in March 2003, to see Garth and Big Pink. New photos by Joe Lore from a concert in Montgomery, NY, 06.01.2003, with Levon Helm, Hubert Sumlin, Jimmy Vivino, Pat O'Shea, and others. More photos by "Brown Eyed Girl" of Robbie and Ronnie Hawkins at the Aboriginal Awards ceremony in Ottawa, Canada, March 28, 2003. On Sunday, June 8th, Professor "Louie" & the Crowmatix will be playing at celebrity chef/culinary rocker Johnny Ciao's "Blues Buffet" in Lebanon, NH, with the legendary Jeff 'Skunk' Baxter (Doobie Brothers/Steely Dan) as guest artist. See the concert list for details. Added pages for the Japanese albums Road to Louisiana (Harry & Mac, 1999) and On the Border (Makoto Kubota, 2000), featuring Levon and Garth. German singer/ songwriter Carl Carlton's new album Love and Respect, featuring Levon Helm on drums, is now available in Germany. Professor "Louie" & the Crowmatix has just released their new CD Live. The album includes live cover versions of songs by The Band and Rick Danko. Robbie Robertson will be receiving an honorary degree from Queen's University in Kingston, Ontario today, according to a recent article from the Globe and Mail. Check out Brooke's Robbie Robertson tattoo. Added more jam session video clips (in RealVideo format) from the recording of the Dixie Hummingbirds' new gospel album Diamond Jubilation, with Garth Hudson and Levon Helm playing together with Tony Garnier and Larry Campbell from Dylan's band. Copied from the Treasure Records web site. ...Garth Hudson, the utterly inclusive and far-ranging keyboard genius and rock legend, who made his first-ever five-night solo stand at the revered jazz room last week. An improper match? Hardly. Hudson displayed a playful contempt for formality, and his witty, intuitive and at times breathtakingly artful amalgam of blues, gospel, country, ragtime, folk, Tin Pan Alley, children's and sacred music is as near to jazz in its purest sense as Louis Armstrong ever got. No cheap trickster, Hudson flew by the seat of his pants, drawing on every tenuous connection that solidified, however briefly, in his crowded imagination and found its way to his fingertips, and achieved several mighty feats of musical fancy, assisted by his wife, Maud, who contributed ethereal vocals on a handful of folk and gospel tunes, and, late in the week, by local jazz guitarist Jake Langley, whose tasty licks added some lovely contextual matter. It was jazzy enough to keep Grammy award-winning jazz diva Diana Krall and her betrothed, composer and singer Elvis Costello, enthralled for most of Hudson's two long sets on Friday night. They refused VIP treatment, it's worth noting, and each insisted on paying the $20 cover when Topp's door staff offered them free seats. "He's a working musician," Krall said. "No freebies." Added a page for the various-artists album Open All Night - On the Road. Added photos and a review from Garth and Maud's concerts in Toronto last week. New painting of The Band, by Larisa McMichael. There's an article about Garth's solo gigs in Toronto last week in The Globe and Mail. It's Levon Helm's birthday! You may use the guestbook to leave a message for the "birthday boy". New concert dates for Jim Weider and The Jim Weider Band. Added a page for Jim Weider's guitar instruction video Basic Licks and Classic Solos for Electric Blues Guitar. Moon Haw Records announces that you can now buy Jim Weider's first album Big Foot with credit cards on-line at CDfreedom or by calling toll free (800)-937-3397. Added a 1987 photo of Rick Danko with Jorma Kaukonen. The Saturday Night Live episode from 1976 with Levon Helm and the RCO All-Stars as musical guests, is being replayed on E! Entertainment Television (ETV) on May 30th, 1pm EST. Garth's solo concerts in Toronto this week are being recorded. We are looking forward to the release of a live CD of the event. The guestbook has been temporarily closed to calm things down. Please read the guestbook FAQ before sending us e-mail about this. Thanks. Added another jam session video clip (in RealVideo format) from the recording of the Dixie Hummingbirds' new gospel album Diamond Jubilation, with Garth Hudson and Levon Helm playing together with Tony Garnier and Larry Campbell from Dylan's band. Copied from the Treasure Records web site. It's 9:20 p.m. We are on the 2nd floor of the Senator Restaurant and Jazz Room The room has been filling up since 8:30. Suddenly out of the darkness Garth and Maud make there way to the left of the stage. Maud makes herself comfortable at a table. Garth is moments away from opening night. There is a Yamaha Grand Piano.....a small electronic keyboard and an Accordion on the stage. It's almost show-time and I'm asked to introduce Garth. I am deeply honored. I mention the fact that we are just 1 short block from 333 Yonge Street the site of Le Coq' Dor where 40 years ago Garth Hudson was a Hawk. I ask Toronto to welcome him home and the place gives out a massive cheer and applause. Garth wastes no time. He sits down at the keyboard and the magic begins. His fingers are moving rapidly between different rhythms. One moment it's classical in sound and within a flash he is into a boogie woogie & then on to a jazzy feel. As he said to me in my interview last Saturday, "John, it's all in the left hand." Everywhere once in awhile he yells out he's in 6/4 time or some other time signature. At one point he begins to sing. Almost sounding like a sailor singing a shanty. For the next hour he goes from Gershwin to other melodies that I do not recognize. He can be very comedic with his movements and quick comments into the mike. I notice that he may have a touch of Victor Borge in him. Flailing his arms and spinning in his chair........never missing a note and still keeping people smiling. The music continues as he moves from one instrumental to another flawlessly. Then it's Intermission. I'm asked again to bring him on along with Maud Hudson who is now on stage. Maud begins with Willow Weep For Me. Garth follows that up with a 15 minute Gershwin moment. Time for Maud once again. This time it's Blind Willy McTell. Another instrumental from Garth and back to Maud with a gospel number. Back to Garth who goes into an instrumental (which I don't know) and suddenly it begins to sound a little familiar. It's the beginning of "It Makes No Difference" with Maud on Vocal. Garth then does a dazzling instrumental that reminds one of "The Genetic Method"; but more jazzy. It turns out to the a "Genetic Method of sorts that takes us right into "The Weight" which Maud does uniquely and brilliantly. Maud really does have a way with a song that makes it her own. I forgot to mention that in both sets Garth takes up the Accordion and gives us many different melodies and bellow shakes. Suddenly you realize it's 12:45 am and they are saying good night. My wife gives Maud a gift of a teapot and Jasmine tea. She loves here tea and is quite happy about that. I say goodnight to Garth and he and Jan Haust invite me back again to introduce him whenever I want. I'm touched. He then mentions to the audience that the next night he'll pay tribute to Ronnie and Rick and Richard. "One night down and five to go John," says Garth as I make my way out into the night thinking back to the a very full evening of Garth Hudson. Kudos to Maud for the vocals. When they look at each other you see that of love and mutual respect. It was a great night. Looking forward to going back another evening this week. 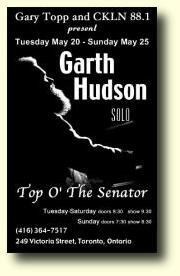 Tonight Garth Hudson is playing the first of six solo concerts at the Top O' The Senator jazz club in Toronto, Canada. Best of luck to you, Maud and Garth! The Last Hombres with Levon Helm are playing at the Rodeo Bar in NYC on Thursday June 12th. Koch Records "Welcome to New York Party" for the Hombres. Free admission. See the concert list for details. "Little Pink" ( ) had a shortlived career in the web adress field. Can anyone see where the new icon ( ) up there is taken from? The little pink house from the Home button of the 1994 version of this web site is back! This time as a small icon in the address field of your web browser. Users of later versions of Netscape, Mozilla, Konqueror or Opera (Norwegian software - highly recommended) browsers should see it "automagically". If you use Microsoft Internet Explorer version 5.0 or later (like most of you do), try to boomark a page at this site ("click "Favorites" in the main menu, then "Add to Favorites", overwriting your bookmark if you have added it to your favorites list earlier. Now choose the page you just bookmarked from the favorite list and you should see the standard MS-IE icon being replaced by a cozy little pink house (yes, I had some time to kill today). On Sun., August 17th, 2003, Levon Helm and Garth Hudson will join gospel legends the Dixie Hummingbirds on stage at the Newport Folk Festival. Added audio samples and a video clip (RealVideo) with Garth Hudson, from the recording sessions for the new gospel album Diamond Jubilation by the Dixie Hummingbirds. Pills and powders, baby, powders and pills. And Rick Danko and Robbie Robertson. Not to mention Steve Perry, Neil Schon, psycho eyes and a stovepipe hat. All in one song, "The Swish" by The Hold Steady. Cleaned up the index to the video clips. Four of Neil Young's '70s and '80s albums that have been previously unavailable on CD, are now being released in digitally remastered versions. These re-releases include On the Beach from 1974 and Hawks and Doves from 1980, both albums with Band involvement. Levon Helm and the Last Hombres recorded two radio shows recently, one with Lenny Bloch at Sirius Radio in New York City and one with David Dye, World Cafe, to be broadcasted later. Here are some photos from the recording at Sirius Radio. The 1999 various-artists CD Tangled up in Blues - Songs of Bob Dylan which includes The Band's last proper studio recording, their version of "One Too Many Mornings" recorded at Levon Helm's studio in Woodstock, has now been re-released both in the US and in Europe under the title All Blues'd Up!. New article from The Long Island Press about Levon Helm and The Last Hombres. Added sound samples in WMA-format (Microsoft Windows Media Audio codec) for all songs on the Danko/Fjeld/Andersen album Ridin' on the Blinds. Included the CD Da Doo Ron Ron (Servitørene, 1994) in the list of albums with cover versions of Band songs. 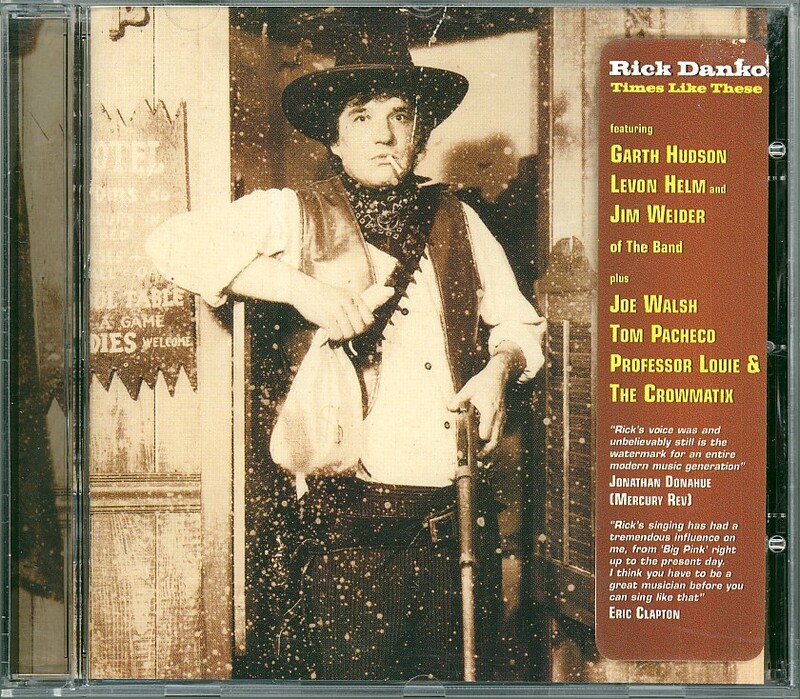 Added a RealVideo clip with Rick Danko performing "Driftin' Away" (from Danko/ Fjeld/ Andersen). From a solo gig at P.J. Flaherty's, Evergreen Park, IL, 10.09.1993. Thanks to Dag Braathen for this one. Maud Hudson will join Garth on a few songs each night during the solo shows in Toronto in May. New concert ad. 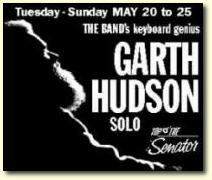 from this week for Garth Hudson's solo gigs in Toronto, May 20-25. New May concert dates for The Jim Weider Band. Updated the page for the Hawks' pre-Danko bass player Rebel Payne. Tracy R.'s Robbie Robertson web site has moved to www.ahroo.com. New concert dates for The Jim Weider Band. and Professor "Louie" & the Crowmatix. Levon Helm plays mandolin on the new album Beautiful Road from Kate Taylor. "Ronnie Hawkins is miraculously cancer-free. Less than a year ago Hawkins was diagnosed with pancreatic cancer and underwent several unsuccessful surgeries. The Rockabilly singer says his recovery is due to unconventional remedies, which included "whisky and pot". Hawkins tried all kinds of treatments including Indian recipes, but he isn't sure what cured him in the end. The Hawk has begun rehearsing again and his immediate plan is to get on the road for a mini-tour across Ontario this summer." Added some Canadian Press photos of The Hawk from this week, contributed by "Mike Nomad." New photos by "Brown Eyed Girl" from Robbie's performance at the Aboriginal Awards ceremony in Ottawa, Canada, March 28, 2003. Ronnie Hawkins was on stage at Robbie's presentation of the award that was given to him. Color cover scans added for Larry Groce's 1979 LP Green Pastures Are Before Me, featuring Garth and Maud Hudson. Contributed by Glenn Trueman. Levon Helm & the Barn Burners will be playing at the Baltimore Blues Festival in Baltimore City, Maryland, on Thursday, May 8th, 2003. New May concert dates for Professor "Louie" & the Crowmatix. There's a good article about the Jim Weider Band (and The Band), from 04.24.2003, in the on-line edition of the Troy Record. "...sounds that are not available to many people are available to him... it was a special night because it felt like Garth's personality really came out, in a way that it hasn't at the Band shows I'd seen -- through his choice of such eclectic music, through his funny, quirky "in his own world" manner on stage, and through his incredible playing. Great show!" --fan review, Woodstock N.Y.
GARTH HUDSON, Solo Piano etc. Canadian-born Garth Hudson, multi-instrumentalist and musical sage, has been heralded as one of the most innovative musicians of the latter half of the twentieth century. Hudson's work with The Band is nothing less than legendary, his playing unique, and his range of musical voices on, among other instruments, the saxophone, the accordion, and various incarnations of the keyboard, protean. Classically trained and globally schooled, Hudson stands as a rare genius in the contemporary music world -- a talent defying categorization. Added a concert ad for Burrito Deluxe's (w/Garth) gigs in Nashville in May. A RealAudio sound sample of the track "Gods Radar" from the upcoming Dixie Hummingbird's 75th anniversary album Diamond Jubilation, featuring Levon and Garth, is now available from the Treasure Records web site. Levon Helm will be playing with The Last Hombres at the Silk City Lounge in Philadelphia on Saturday April 26. See the concert list for details. More photos from the concert with Levon Helm and the Last Hombres in Somerville, MA, April 12, 2003. Cover art and sound samples added for Ronnie Hawkins' 2002 album Still Cruisin', featuring Levon Helm and Robbie Robertson. Contributed by John Donabie. Richie Hayward, a fantastic drummer and a founding member of the legendary Little Feat who played with Levon Helm last year, now has his own web site. Check it out and see if you can find their link to this site. And you may also contribute to a good cause, the trust fund for Richie's son Severn who was seriously injured in an auto accident in 2001, while you're there. New photos by Joan Hathaway of Levon Helm and the Last Hombres, from the concert in Somerville, MA, April 12, 2003. 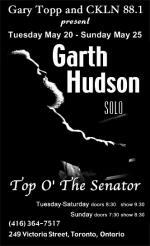 On May 22, 2003, Garth Hudson will be playing grand piano on the TV show Studio 2 on TVO, Ontario, Canada's publicly-funded TV station. Levon Helm will be playing drums on Rufus Wainwright's new album, which is due this fall. For more information, see the on-line articles/interviews in ChartAttack and Rolling Stone, and the Rufus Wainwright web site. Thanks to Richard Goldman for sending us the links. Garth Hudson will soon be going to Nashville, TN, for rehearsals with Burrito Deluxe (with two new members). They will give three concerts in Nashville in the beginning of May. See the concert list for details. New photo from Levon's and Garth's 2003 studio sessions with the Dixie Hummingbirds. We've been told that Garth Hudson recorded with Norah Jones this week! More details later. Now back to Rømø, the pickled herring, the Carlsberg and the Gammel Dansk. Easter Holiday is here! We're off for a week or so, to lovely old Ribe in Denmark. Y'all behave now. New photos by "Crabgrass" of The Jim Weider Band at the Bottom Line, New York City, 03.21.2003. Added photos of Garth Hudson with Jim Weider and Tom Pacheco, from Pattenburg, NJ, 02.28.2003. Check out Robert Santelli's article about the 1973 Watkins Glen festival. Added a 1974 painting of The Band by Japanese artist Yasuo Yagi. Contributed by Ichiro Miyazaki. Two new 1-minute sound samples (WAV- and MPEG3-files) from live performances by Levon Helm & the Barn Burners. Thanks to Joe Lore and Butch Dener for the contribution. New scan of a concert ad from NOW magazine for Garth's solo concerts at the Top O’ The Senator in Toronto in May. New MPEG-3 file (4.6MB) with a good live cover version of "The Weight" by the Black Crowes (up there with the cover by The Jan ;-). The Crowes also used to do "The Night They Drove Old Dixie Down" (3.5MB) at their gigs. Added a page for the 1965 US Levon & the Hawks promo single The Stones I Throw/ He Don't Love You. Thanks to Doug Bell for sending us the for sending us label scans. Richard Manuel, the heart and the soul of The Band, would've been 60 today. Too soon gone. New photos from the concert with Levon Helm and the Barn Burners and Jimmy Vivino in Chester, NY, in February. Added a bunch of photos of Robbie from March 2003 to the archives. Photos "liberated" from WireImage by "Misty." New Tour '74 photo. Thanks to Tom Moretti of Woodstock Records for sending us this one. This coming Saturday night April 5th, the "Nighthawks" radio show on Provincetown, MA's WOMR 92.1, hosted by Bob Reichers, will be featuring "Another night with Bob Dylan & the Band"-- 3 solid hours of nothing but The Band (together and solo) and Dylan. WOMR's "Nighthawks" is on 10:00pm - 1:00am PST / 1:00am - 4:00am EST and can be heard live anywhere in the world by logging onto www.womr.org. Added Canadian Press photos of Robbie Robertson and Ronnie Hawkins from March 27. "Aboriginal awards honour rocker Robbie Robertson"
"Robbie Robertson gets aboriginal award"
Thanks to "Brown Eyed Girl" for sending us the links. New 1983 photo of Richard Manuel. Contributed by Serge Daniloff. Created a new search mechanism for searching The Band web site. We are now using the excellent Google search engine. The Canadian Press published an article yesterday about Robbie Robertson and the National Aboriginal Achievement Awards that he will be receiving in Ottawa, Canada, tonight. "I had six or seven months to live. So I doubled up -- no, tripled up -- on everything: whisky, drugs, cigarettes." "Them germs are afraid to get into my body. I knew that eventually they'd have to get out. They couldn't take it. There's so much chemicals and sh-t in my body that they went insane and started killin' one another." "Ricky Danko and that bunch ... when I got 'em they had to roll up their sleeves to know which way to walk. Ricky Danko was an apprentice butcher. Richard Manuel was a 12-year-old alcoholic from Stratford. Robbie (Robertson) was a kid on the street, out of the eighth grade. I hired Garth Hudson just to teach music to the guys." Ronnie Hawkins is playing a show at the Barrymore's Music Hall in Ottawa, Canada, tonight. Robbie Robertson is in town for the Aboriginal Awards, and is expected to show up at the gig. Rick Danko's final album Times Like These has been officially released in Europe by CoraZong Records, see the label's review/press release for the CD. CoraZong is also behind the European release of Garth Hudson's 2001 album The Sea to the North. Jim Weider is doing a master class on rockabilly guitar on July 24th at the National Guitar Workshop in New Milford, CT.
New version of the short history of The Band, from the All-Music Guide. Added pages for the CDs Original Artist Hit List (The Band, 2003), Now This Is What We Call Blues, Vol. 420 (Various Artists, 2003) and The Wreckoning (Boomkat, 2003). Woodstock Records is announcing the upcoming CD release of Professor "Louie" & The Crowmatix - Live - a brand new CD featuring tracks recorded during their most recent tour featuring Tom "Bones" Malone and the "Rock Of Ages" horn section and fiddleman Larry Packer. Expect this release to hit stores in June 2003. Levon Helm & The Last Hombres are playing at Johnny D's in Somerville, MA, on April 12. See the concert listing for details. Included an MPEG-3 file with a live cover of "Besse Smith" by Norah Jones (4.9MB), recorded at the House of Blues, Chicago, IL, April 16, 2002. Copied from the Norah Jones web site. Rick at The Wetlands in New York City, 02.03.1993, with Sredni Vollmer on harmonica and background vocals. From a Danko/Hudson concert in the late '80s or early '90s. Included chords and lyrics for the song "Tura-Lura-Lural (That's An Irish Lullaby)" from The Last Waltz. Thanks to Neil Fitzpatrick for the transcription. We are in the final stages of tracking The Dixie Hummingbird's 75th Anniversary Album "Diamond Jubilation". Larry Campbell is the producer, string guy and has contributed two songs. Tony's on bass, Levon's on drums, and Garth's on Wurlitzer, accordian, Hammond, and piano. George will be brought in for a little percussion work. We also have a song from Bob on the album as well as one from Julie Miller. Ira Tucker Sr., who has been in The Hummingbirds for 64 YEARS, says it's the best record they have ever made and Levon has said it's one of the best projects he's ever been involved with. You can sign up to the Hummingbird mailing list if you go to www.treasurerecords.com and we'll keep you posted on the progress of this really cool project. As a side note, we were able to capture two jams in the studio on video. Larry and Garth doing a violin/accordian duet on Orange Blossom Special, My Old Kentucky Home, assorted horn pipes, and a few weird polkas. The other was Larry, Tony, Levon, and Garth doing swing standards like "Avalon". Assuming we get everyone's permission, we'll post these on our site. On Thursday March 27th, at 11am Eastern time, E Entertainment Television will show the October 1976 episode of Saturday Night Live with the Band as musical guests. Bob Reichers, the DJ/ Band fan with the Nighthawks radio show on WOMR-FM 92.1, has written a review on the "Blues on Stage" web site of Jeff Alexander & Larry Thurston's 2002 blues album School for Fools, featuring Levon Helm on drums. New photos from the concert with Garth Hudson and Burrito Deluxe in Austin, TX, 03.15.2003. Added an audience recording of "It Makes No Difference" (5.9MB MPEG-3 file) from the 2001 Hudson/Fjeld/Andersen tour, with Eric Andersen's daugher Sari on lead vocal. Recorded in Langesund, Norway, 05.25.2001. Contributed by Dag Braathen. 10 years ago today, on March 17 1993, Rick Danko played a solo concert in Copenhagen, Denmark. Jan Ingemann Sørensen has sent us scans of the ticket, concert ad and other items to mark the anniversary. Added a new scan of the "Next of Kin" photo from Music from Big Pink and a chart showing the names of the persons in the photo. Thanks to Tracy R. for scanning and creating the chart, and to "Cousin Paul" (who is in the photo himself) for the list of names. New, short audio sample of folk singer Dar Williams' cover version of Richard Manuel's "Whispering Pines," from the 2003 CD The Beauty of the Rain. Added an MPEG-3 file (13MB!) with Hoyt Axton's cover version of "The Weight" from the 1990 album Spin of the Wheel. Thanks to Kevin aka "bandfan@aol.com" for sending us the audio file. A "Ringo-Starr-centric" The Band discography is available from the Beatles Unlimited web site. Jim played on five new songs for Mavis Staples' new record called In Times like These, and also co-wrote the single "Have A Little Faith" for her record. Jim played guitar on a new Johhny Cash tribute record with Mavis Staples, on "Will The Circle Be Unbroken." Jim played on Tom Pachecho's (Folk Grammy nominated album) There Was A Time, 2002. An interview with Jim Weider is available both in Italian and English from the "Musical Textures" section of the Italian net music resource FortePiano. Added/updated pages for the Dylan/Band bootleg LPs Troubled Troubadour, VD Waltz and Isle of Wight. Thanks to Jeff Nugent from down under for sending us album scans (not to mention CD-Rs with the music, we'll add some sound samples later). Garth will be giving solo performances at Toronto's Top O’ The Senator jazz club on May 20-25. See the concerts page for details. He will also play with steel guitarist Sneaky Pete Kleinow's band Burrito Deluxe at the South by Southwest music fest in Austin, TX, at the Continental Club, on March 15. 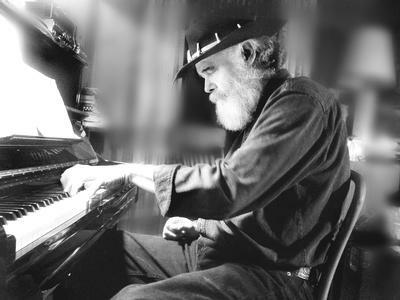 Added the article "Genetically Speaking - Garth Hudson steps into the pianistic limelight" from The Woodstock Times, March 2003. Thanks to Heidi & Tom for scanning and typing. Levon Helm & The Last Hombres are playing at Leavy's Last Stop Cafe in Huntington Station, NY on Saturday March 22. See the concert listing for details. Added the new CD Born to Run 2003 Volume 1 to the list of various-artists albums. Included two 1976 photos of Rick Danko on stage with folk singer Fred Neil. Added the album Suite Feeling (Lighthouse, 1969) and the DVD Live In New Orleans (Norah (yum) Jones, 2003) to the list of cover versions of Band songs. New photos from Robbie Robertson's keynote interview during Canadian Music Week, March 1, 2003. Photos taken by "Brown Eyed Girl". Robbie Robertson will be inducted into the Canada Walk of Fame this year, according to an article at canada.com. There's an interesting article in the latest Film Quarterly from University of California Press: "Robbie Robertson's Big Break: a Reevaluation of Martin Scorsese's The Last Waltz" by Stephen E. Severn. Film Quarterly, Vol. 56, No. 2, Winter 2002-2003. The magazine and the article are available on-line on a pay-per-view basis. GARTH HUDSON of "The Band"
Added a photo of Robbie from the article "Still Waltzing" in Toronto's Globe and Mail, March 1, 2003. Scan by "Brown-Eyed Girl." The guestbook at The Band web site was temporarily closed today, after it was used this morning for very personal and potentially harmful messages about individuals affiliated with the site. The chat room is also closed for now. Please note that the closing of these pages has nothing to do with recent discussions going on there. 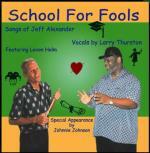 Included a new UK review of Jeff Alexander & Larry Thurston's 2002 blues album School for Fools, featuring Levon Helm on drums. New March concert dates for Jim Weider/ The Jim Weider Band. Added a scan of the badge/ticket for the Canadian Music Week keynote interview with Robbie Robertson yesterday. Contributed by "Brown Eyed Girl." On Wednesday, March 5th, Garth Hudson talks about and plays his old and new music with Arlene and Bob Levinson at their "Discussing Dylan" class at the New School University in Greenwich Village, 66 West 12th Street, room B-001, NY, NY at 7:45. Free. Class held at 66 W 12th Street (New School Main Building). There is parking on the street, usually, or at the many indoor lots in the area. There is a handicapped door right there at the front entrance and there is an elevator to the basement. Please direct questions to Bob and Arlene Levinson, 516-949-7520. Added a Canadian Press high-quality photo of Robbie (1500x2000 pixels, 521K), taken in Toronto this week. Thanks to "Mike Nomad" for sending us this one. 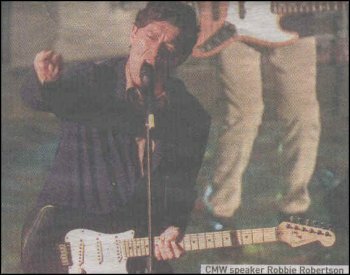 Robbie Robertson will speak at the Canadian Music Week today, Saturday March 1, 2003. Robbie is the subject of this years CMW keynote interview, taking place at the at the Westin Harbour Ballroom, 1 Harbour Square, Toronto, at 5:30. Thanks to "Brown Eyed Girl" for the update. Back from yet another trip down South to visit our Danish brothers. As usual when we return, the mailbox is full of goodies for The Band site - let's start with these new photos of Levon and friends at the "Salute to the Blues" concert in NY earlier this month. Added a travel report from two young Band fans' trip to the Woodstock area in December 2002. Includes some nice pics of Levon Helm & the Barn Burners. Added three 1985 photos of The Band from a concert in New York. Photos copyright © Robert Bennet, all righs reserved. Hard copies of these images and thousands of others are available for purchase from Bennet's Art of Rock and Roll web site. Created new web server statistics from the logfiles for January 2003. The average daily amount of data transferred has increased from 3.5 to 4.5 Gbytes since June 2002. Almost 100.000 different IP addresses visited The Band site last month. New photos of Levon Helm & the Barn Burners, from a gig in Kingston, NY, September 18, 2002. This Friday, 02.21.2003, at 2:00 PM, the New York public radio station 90.7 WFUV will broadcast the 1996 concert with The Band from Mountain Stage. WFUV broadcasts are also available on the internet. Our favorite Italian Band-fans, The Beards, have recorded a Band tribute CD, due for release in April. New photos of Robbie Robertson from 1988 and 2003. Scanned by "Brown Eyed Girl." The new, exclusive The Last Waltz limited edition vinyl 3-LP set with loads of extra goodies has now been released by Rhino Handmade. 1500 copies, signed by Robbie, are available for $75 from rhino.com. The Band desktop wallpapers for Windows are now available from The Band Tablature Web site. Due to a major fire in Oslo yesterday (caused by a crash between a freight train and a fuel truck), our Internet connection was lost and The Band web site was off-line from around 4 pm (MET) until 1 am. Btw, we've just come back from an extended (some would say "lost", I guess) weekend in wonderful Copenhagen. The e-mail backlog is quite extensive, please be patient. Levon Helm and Garth Hudson worked with German singer Carl Carlton and his band the Songdogs before Christmas 2002, recording tracks for Carlton's new album Love and Respect. The album will be released in Germany in March this year. Ronnie Hawkins is on the cover of the Winter 2003 edition of roots music magazine Blue Suede News. Garth Hudson will be playing in Europe in February together with steel guitar legend Sneaky Pete Kleinow's band Burrito Deluxe, to promote the release of their new CD Georgia Peach. See the concert page for details. Blues legend Hubert Sumlin's 2000/2001 sessions, where he recorded Muddy Waters material with Levon Helm, Keith Richards, Eric Clapton and many others, are finally being released by Warner/Atlantic, on a CD titled About Them Shoes. "Larry Thurston's... back to give voice to a dozen songs of Alexander... A warm, genuine voice that sometimes made me think of Big George Jackson, and once in a while also Lou Rawls, when he's singing in the lower regions..."
"Blueswriter Jeff Alexander, dividing his time between Brooklyn, New York and St. Louis, has poured his heart into a winner. He has gathered together some of both regions' blues greats... Alexander puts together one of the best blues albums of the year." --Sauce Magazine, St Louis Mo. "School For Fools, Songs of Jeff Alexander is a superb new blues CD with down to earth lyrics from the heart that anyone can relate to. Larry Thurston's rich, smooth vocals pour the songs out in an easy, comfortable way that made me at home with this CD the first time I heard it. School for Fools immediately became a staple on my play list!" --Mary C., The Roadhouse, KOPN FM, Columbia, Mo. "As well as featuring plenty of good blues, this album also contains some arresting and interesting songwriting..."
"The standard of the disc's twelve original compositions is uniformly high, featuring memorable tunes and clever, thoughtful lyrics laced with a nice dash of humour. The musical accompaniement to Larry's warm, powerful... vocals is provided by a highly talented group of musicians including players the calibre of former Band drummer Levon Helm, and the legendary Johnnie Johnson on the 88s... There's an underlying strength and muscularity to the performances... that'll keep your feet tapping and sustain your attention right til the very last note." If you like the blues, you need to listen to this CD (IMHO, of course). Added an MPEG-3 file (7.3MB) with Australian singer/songwriter Paul Kelly doing a live version of The Band's "It Makes No Difference", at the 400 Bar in Minneapolis, 29.03.2002. Contributed by Peter Huish, Australia. The latest issue of Entertainment Weekly has a small quote from Robbie Robertson. Robbie was on-hand at the DVD Premiere Awards. He won for best audio commentary for The Last Waltz, and he basically commented on how it was the "Twilight Zone of awards shows". It's not clear if Robbie himself won the award for his part of the commentary track or if he was accepting it on behalf of the movie itself. We may be seeing more photographic material from the "golden age" soon, according to The Band's photographer Elliott Landy: "One future project for me might be to scan a thousand or so Band images and put them in low res on a CD-ROM. I have all these great photos of them that will, otherwise, probably never be seen." Yes, please, Elliott. The "Salute to the Blues" benefit concert at New York's Radio City Music Hall this Friday, with Levon Helm as one of the many great performers, is going to be filmed by PBS and will be aired on TV in the spring. Added the album Steve King & Johnnie Putman present "Life After Dark" (Various Artists, 2000), featuring a 1999 live recording with Rick Danko & Professor Louie. Info. contributed by Hideki Watanabe. The new Townhall album The New Song, featuring Garth Hudson, is now available. A CD release party is planned at the TLA on South Street in Philadelphia, PA on February 15th. Added photos of Robbie Robertson and other celebrities in Canada's Flare magazine, February 2003. Thanks to "Brown Eyed Girl" for scanning the magazine. Garth Hudson has teamed up with the Canadian artist agency Amok. More information available from Amok's home page. On March 5, Garth and Maud Hudson will join Arlene and Bob Levinson at a class they teach at the New School University in Greenwich Village, New York, called "Discussing Dylan." Garth will play original music and discuss his time with Bob Dylan. Band-related people like Elliott Landy, Al Aronowitz and Seth Rogovoy will also contribute to the class. Created a photo gallery with material copied from Elliott Landy's web site. High-quality versions of Landy's Band/ Dylan photos and loads of other stuff about the '60s Woodstock scene are available on the CD-ROM Elliott Landy's Woodstock Vision, The Spirit of A Generation. Added the album Come Together (Goody Two Shoes, 1969) to the list of albums with cover versions of Band songs. Included an English translation of "Am Tag Als Conny Kramer Starb". German singer Juliane Werding had a big national hit with this horrible "cover version" of "The Night They Drove Old Dixie Down" in 1972. Included a photo of Rick Danko with Ed Voci, from Deerefield, IL, December 1999. 1964 John Hammond Red Bird single. From the sessions with Rick Danko and Robbie Robertson that later was released on the 1967 LP I Can Tell. Picture sleeve for the Canadian food-for-Africa song "Tears Are Not Enough", featuring Richard Manuel. The song also appears on the 1985 album We Are The World. "Uh-uh-uh"/"Leave me Alone" 1965 Canadian single by the Canadian Squires, aka Levon & the Hawks. Toronto, Ontario (January 23, 2003) - Music icon Robbie Robertson will be treated to a keynote interview by MuchMoreMusic's Jana Lynne White on Saturday, March 1 at 5:30 p.m., part of this year's Canadian Music Week Executive Conference in Toronto. Robertson's keynote is presented by the Songwriters Association of Canada and sponsored by the Ontario Media Development Corporation. Robertson will discuss his long history as guitarist for The Band, solo artist, movie soundtrack composer, actor, producer and executive with DreamWorks Records. Accompanying Robertson are two recently signed DreamWorks/Universal Music Canada artists - Dana Glover and Boomkat - who will showcase at the Canadian Music Week Festival. Hot new singer/songwriter Dana Glover will perform material from her just-released album Testimony. The North Carolina born former model has lent her voice to several film soundtracks, including the double-platinum Shrek, The Wedding Planner and Two Weeks Notice. Boomkat, featuring lead singer Taryn Manning, a contributor to the film soundtrack for rapper Eminem's blockbuster hit, 8 Mile, will also perform. An actress as well as a singer, Manning has appeared in the films Crazy/Beautiful, Crossroads and White Oleander. She will be featured in an upcoming episode of Boston Public (FOX TV) as part of a story line written specially for her and her band by creator David E. Kelly (Ally McBeal). Other keynote speakers confirmed for the Canadian Music Week Executive Conference include: Pat Dininzio (The Smithereens), Andrew Hill, Daniel Lanois, Bob Lefsetz and Don Tapscott. Celebrating its 20th anniversary, Canadian Music Week is the single largest entertainment initiative in Canada dedicated to the expression and growth of the country's media and entertainment industries. CMW combines two information-intensive conferences; a cutting-edge trade exposition; five awards shows and the Canadian Music Week Festival. Held over a four-day period from February 26 to March 1, 2003, in Toronto, Canada, the event attracts participants from across the country and around the world. New version of Peter Viney's article "The rumours - the unsubstantiated (& unreleased) sessions by Band members". Please send comments, corrections and additions directly to Peter or post them in the guestbook. "This is the age of the disposal lighter, camera, diapers. Music has become a quick fix and it's a novelty." --Robbie Robertson, The Rolling Stone Daily, January 2003. Included a page for the 1985 soundtrack album The Right Stuff/ North & South. Garth Hudson played on the original soundtrack for The Right Stuff, according to Levon. Added a nice interview with Levon Helm from the fall 2002 issue of the Southern music and culture magazine Gritz. Thanks to Amanda for typing and spellchecking the article. New photos by Bob Wigo from the New Years concert at Bearsville with Levon Helm & the Barn Burners and the Jim Weider Band. On March 28, Robbie Robertson will receive a lifetime achievement award during the National Aboriginal Achievement Awards ceremony at the National Arts Centre in Ottawa, according to an article in the Ottawa Citizen. A CD reissue of Levon Helm's hard to find self-titled album from 1978 was released in November 2002 on the UK-based Acadia label, a subsidiary of Evangeline Recorded Works (aka "The Teen-free Record Label"). Available from e.g. Tower Records and bestbuy.com. Added more information about the new, Robbie Robertson-supervised soundtrack album Gangs of New York. Added a link to the new Four Men & A Dog web site to the list of related artists. Levon will be playing at the Radio City Music Hall in New York City on February 7th, at the "Salute to the Blues" benefit concert, that also includes performers like B.B. King, Robert Cray, Bonnie Raitt, Lyle Lovett, Aaron Neville, Keb' Mo', Dr. John, David Johanson, Vernon Reid, Mavis Staples, Gregg Allman, Chuck D, Steve Jordan, Hubert Sumlin and many, many more. The concert will be filmed and recorded for release on CD and video. The benefit concert kicks off a year-long celebration (2003 has been declared "Year of the Blues" by the United States Congress). The concert will be presented by Martin Scorsese and sponsored by Volkswagen. All profits from the concert and concert film will benefit the BluesMusic Foundation - a new nonprofit charitable organization that supports blues education and other programs around the country. Levon Helm, Larry Campbell and Tony Garnier are currently doing session work in Somers Point, NJ, with Southern gospel legends the Dixie Hummingbirds. New photos by Alex Layman, from the New Years Eve concert with Levon Helm & the Barn Burners in Bearsville. Thanks to Joe Lore for scanning. The Levon Helm CD Souvenir is now sold out and is no longer available from Woodstock Records. The Last Hombres' 2002 indie album Redemption, with Levon Helm on drums on all tracks, is being re-released by Koch Records on January 21. See the press release and new promo photo from Koch Entertainment. Added session photos and MPEG-3 sound samples from Redemption. Copied from the Last Hombres web site. Added/ updated pages for the two various-artists albums Teenage Shutdown, Vol. 14 - Howlin' For My Darlin' and Pebbles, Vol. 10, both featuring the Canadian Squires/ Hawks 1964/65 B-side "Leave Me Alone." Garth Hudson and Jim Weider will be playing with Tom Pacheco at the Pattenburg House in Pattenburg, NJ, on Friday February 28th. Added a page for the Elliott Landy photo book Woodstock Dream. Thanks to "Brown Eyed Girl" for sending us info. about this one. Loads of great '60s Band photos (like this one) are now available from the re-vamped Elliott Landy web site. Time to book your tickets for "An intimate evening with Garth Hudson featuring Maud Hudson on vocals," at the Colony Cafe in Woodstock, NY, Saturday, March 8, 2003. See the concert list for details. Garth & Maud Hudson will be performing with the Hawks for the Ronnie Hawkins birthday celebration at the Red Dog Tavern in Peterborough, Ontario, Canada, on January 10. Peter Viney has written version 0.1 of an article titled "The rumours - the unsubstantiated sessions by Band members". Please send comments, corrections and additions directly to Peter or post them in the guestbook. Sad news: Richard Newell, a.k.a. King Biscuit Boy, a former Hawk and a good friend of Levon's, died during the Christmas season..
James Reaney of The London Free Press (London, Ontario, Canada) will give a presentation titled "Garth Hudson: A Great London Musician" at the Metropolitan United Church in London during their week of guest speakers, performers, etc., on Jan. 15, 2003. Last year, Reaney talked about the bass player and fiddler Jack Fallon who grew up in the 1920s and 1930s not too far from the Hudson family farm outside London. See the Metropolitan United Church web site for information about location and parking.